While fire has been used in some instances to control the increase of woody plants, it has also been reported that fire may cause an increase in certain fire-tolerant Acacia tree species. This study investigated germination of Acacia karroo, A. luederitzii and Dichrostachys cinerea, thought to be increasing in density, as well as the historically successful encroaching woody species, A. nilotica, in savanna grassland, Hluhluwe-iMfolozi Park, South Africa. A. karroo is thought to be replacing A. nilotica as the dominant microphyllous species in the park. We tested the hypothesis that observed increases in certain woody plants in a savanna were related to seed germination and seedling establishment. Germination is compared among species for burnt and unburnt seeds on burnt and unburnt plots at three different locations for both hot and cool fires. Acacia karroo showed higher germination (A. karroo 5.1%, A. nilotica 1.5% and A. luederitzii 5.0%) levels and better establishment (A. karroo 4.9%, A. nilotica 0.4% and A. luederitzii 0.4%). Seeds of the shrub Dichrostachys cinerea did not germinate in the field after fire and it is thought that some other germination cue is needed. On average, burning of A. karroo, A. nilotica and A. luederitzii seeds did not affect germination. There was a significant difference in the germination of burnt seeds on burnt sites (4.5%) and burnt seeds on unburnt plots (2.5%). Similarly, unburnt seeds on unburnt sites germinated better (4.9%) than unburnt seeds on burnt sites (2.8%). We conclude that a combination of factors may be responsible for the success of A. karroo and that fires may not be hot enough or may occur at the wrong time of year to control A. karroo establishment in HiP. Although germination and establishment of A. karroo was higher than for A. nilotica a competitive advantage after fire could not be shown. The increasing density in the woody component of savannas has been widely reported [1–5] with special mention being made of Acacia karroo Hayne [6, 7] and A. nilotica (L.) Willd. Ex Del. subsp. kraussiana (Benth.) Brenan, [8, 9]. in some areas, as major contributors to the phenomenon. In Hluhluwe-iMfolozi Park Dichrostachys cinerea (L.) Wight & Arn. and A. luederitzii Engl. var. retinens (Sim) Ross & Brenan are also thought to contribute to this phenomenon. In hard seeded legumes dormancy is broken by rupturing part of the seed coat. The rupturing of the seed coat may be induced by heat from fire  enabling water to enter the seed and start the process of germination. Many studies have confirmed a release of legume seeds from dormancy after fire [10–17]. Fire temperature or intensity also has an effect on the germination of seeds [17, 18] and low intensity fires may not be enough to break dormancy of hard-seeded legumes . In other cases lower fire temperatures are preferable for germination with an increase in fire temperature causing seed mortality . While some studies report that a decrease in grass cover favours the establishment of woody seedlings due to reduced competition [20, 21], others [6, 22] challenge these findings. These differences may however, be a result of species reacting differently to fire or competition. Some Acacia species are shade intolerant resulting in decreased seedling establishment in shady areas [20, 23, 24]. Other Acacia species have been found to be tolerant of low light conditions and may even experience increased seedling survival . The frequency of fires may affect the direction of change in woody plant density . While it has been suggested that fire may increase Acacia densities , it is also used to clear acacias from grassland . This contradictory situation in the literature concerning the effect of fire necessitates further research, as it is clear that continuous use of incorrect burning practices may have disastrous consequences. This study investigated the direct (heat) and indirect (grass removal) effects of fire on seed germination and seedling establishment of A. nilotica, A. karroo, A. luederitzii and Dichrostachys cinerea in Hluhluwe-iMfolozi Park (HiP), where an increase in woody plant density over the past 40 years has been reported [26–28]. It has also been reported that A. karroo is apparently replacing A. nilotica as the dominant microphyllous element [27, 28]. This study reports on the effects of burning, fire intensity and burning of sites on germination; burning, fire intensity, burning of sites and grass length (shade) on seedling establishment and specific species responses to treatments (treatment species interactions). None of the seeds of D. cinerea germinated in the field and it was therefore excluded from the model for the field experiment. Testing for differences among treatments was based on the maximum number of seedlings for each species at each location over the 31-week period (Figure 2). A description of the factors used in both the germination and establishment models is given in Table 1. Mean number of germinated seeds recorded over a 31-week period at three different locations in HiP for a) Acacia karroo, b) Acacia luederitzii and c) Acacia nilotica. Descriptions of factors used in the models and number of seeds used for each factor. The ratio of the model deviance to the degrees of freedom was small (0.29) indicating that the model was a good fit. 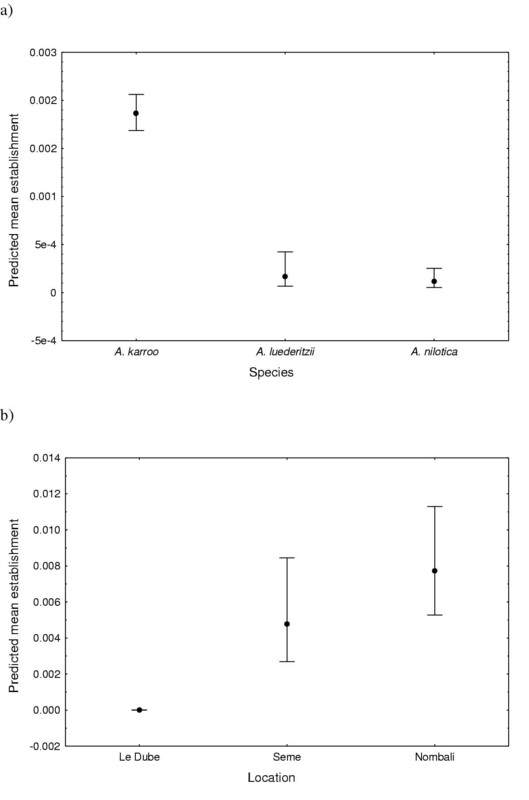 Location and species were the only main effects significantly affecting germination (Table 2). Acacia karroo had the highest germination of all species (Table 1). Statistics indicating significance of the factors and interactions on germination. Significant factors are in bold. Interaction terms that had a significant effect on germination were, location × grass length, burn status × site burn status and grass length × site burn status (Table 2). Germination of burnt seeds in burnt sites (4.5%) was significantly higher than that of burnt seeds in unburnt sites (2.5%). Similarly, unburnt seeds in unburnt sites had a higher germination percentage (4.9%) than unburnt seeds in burnt sites (2.8%). Thus the odds of germinating are four times more for A. karroo than for A. nilotica. Similarly A. nilotica was four times less likely to germinate than A. luederitzii while A. karroo and A. luederitzii had the same odds of germinating. Differences in germination among species for the various treatments are given in Table 3. A comparison of germination among species for the different levels of the main factors. There was 2.3 times less germination at Le Dube than at Nombali and 2.6 times less at Le Dube than at Seme. Germinations were 1.2 times more likely at Seme than at Nombali. The ratio of the model deviance to the degrees of freedom was small (0.17) indicating that the model fitted the data well. Location and species were the only main effects significantly affecting establishment in the field (Table 4 & Figure 3). Acacia karroo showed significantly higher percentage establishment than any of the other species (Additional file 2, Table 5 & Figure 3). Statistics indicating significance of factors and interactions on establishment. Significant factors are indicated in bold. Predicted mean establishment for the significant main effects of a) species and b) location. Vertical error bars show 95% confidence limits. Interaction terms, location × burn status, location × grass length, location × site burn status, burn status × site burn status and grass length × site burn status had a significant effect on establishment (Table 4) (Figure 4). Predicted mean establishment for significant interactions of site burn status and a) location, b) seed burn status and c) grass length. The solid line represents unburnt sites and the dotted line burnt sites. Vertical error bars show 95% confidence limits. Additional file 2 gives the estimated odds of non-establishment and their associated probabilities for the factors and their interactions. The odds ratios for significant effects were calculated and are given (see Additional file 3). Acacia karroo was 16.2 times more likely to establish than A. nilotica. Similarly A. luederitzii was 1.4 times more likely to establish than A. nilotica while A. karroo had 11.2 times more chance of establishing than A. luederitzii. Species differences in establishment for the various treatments are given in Table 5. The odds of establishment were 8046.2 times less at Le Dube than at Nombali and 5850.5 times less at Le Dube than at Seme. 1.4 times more seedlings were likely to establish at Nombali than at Seme. The lack of germination of D. cinerea in the field suggests that some disturbance other than fire is needed to cause a release from dormancy and commence germination. Germination of all species in the field was low. As the seeds relied on cotyledons for food, soil moisture may have been a limiting factor. As rainfall was not recorded, this should be kept in mind when interpreting the results. Five point one percent of A. karroo seeds germinated, which was higher than the other two species. Story  found similar levels of germination for A. karroo, with 6.6% of seeds germinating under natural conditions in the field. He also found that A. karroo germination was erratic, with germinations still being recorded after 423 days. This was similar to what was found in this study, with the number of A. karroo seedlings still increasing until the end of the experiment. Acacia nilotica also showed dormancy with sporadic germination events over the 31-week period. Acacia luederitzii did not show dormancy with most germinations taking place in the first 3 weeks of the experiment. Acacia nilotica has a thick seed coat, which could account for it's poor level of germination. One would predict increased germination of burnt seeds due to a breaking of dormancy , but this was not the case. A possible explanation is that the temperature of the fires in this study, though not measured, might not have been sufficient to break dormancy in this species. Some Acacia species are temperature specific, suggesting a temperature threshold for germination [18, 20]. This is unlikely in this case as Radford et al. found A. nilotica seeds to be highly vulnerable to fire with a 80% mortality of seeds on the soil surface. The current study, however, found no difference in germination between burnt and unburnt seed or seeds burnt at different temperatures. This finding is inconsistent with the recent study by Kanz  who found increased seed germination in low fires compared to the control as well as that of Okello and Young  who found increased germination of unburnt seeds. Auld & O'Connell  had similar results to that of Kanz  with strong germination responses to heat. Location had a significant effect on germination with Le Dube having very low germination overall and Seme having the most germinations. Germination at Nombali and Seme were similar. Site-specific effects may be attributed to various factors such as microclimate or soil type. Sites may also have different water infiltration rates and runoff, which may result in differences in germination levels. Okello and Young , however, found that soil type did not affect germination or establishment of Acacia drepanolobium in Kenya. The current study did not find a difference in the number of seedlings in burnt and unburnt patches. While neither burning of seeds nor burning of sites had any effect on germination, the interaction factor proved significant with unburnt seeds showing increased germination in unburnt sites as did burnt seeds in burnt sites. Kanz  also found greater seedling emergence of unburnt seeds in unburnt areas. This might be a result of burnt seeds imbibing faster than unburnt seeds, possibly making them more susceptible to rot. Burnt seeds would therefore show poorer germination in unburnt areas due to increased moisture retention. Similarly, unburnt seeds would require more moisture to imbibe, resulting in decreased germination in burnt areas due to decreased moisture in these open areas. Whilst more seeds germinated in short grass at both Le Dube and Nombali, those at the short-grass site (Seme) had higher levels of germination in tall grass sites. The short grass site at Seme is a white rhinoceros (Ceratotherium simum) grazing lawn with very short grass, which may lead to seeds losing moisture through more direct sunlight. This suggests a similar pattern to the seed burn × site burn interaction. The tall grass site at Seme had higher germination than any of the other tall or short grass sites. This may be due to possible site-specific effects mentioned earlier. There was also an interaction between grass length and site burn with seeds in burnt, short grass showing higher germination than those in burnt, tall grass and unburnt sites showing higher germination in tall grass. As half of the seeds on a burnt or unburnt site were burnt themselves, it is possible that this interaction is due to temperature sensitivity in seeds. Burning in tall grass (hotter fires) may be detrimental to the germination of seeds  while cooler fires may be sufficient to break dormancy and cause germination. Higher germinations in unburnt tall grass areas suggest a shade effect. This is not certain, as the effects of shade and grass competition were not separated in this study. Acacia karroo has however been reported as having an increased ability to survive in shade with recruitment of seedlings being dependent on moisture availability . Tall grass species may retain more moisture than short grass species, affording seeds a better opportunity for germination. No species factor interactions were observed suggesting that though species had different germination levels, they did not respond differently to the treatments. The same factors and interactions found to be significant influences on germination were found to influence establishment. This was expected as increased germination for these treatments would result in better establishment. The interaction patterns for most of the treatments, however, were different to those of the germination model. Owing to the low levels of germination, interspecific and intraspecific competition was thought to play a minor role in seedling establishment. Le Dube again had the least seedlings at 31 weeks while Nombali had the best establishment. Seme, which had the highest level of germination, had establishment levels somewhere between that of the other two sites. It is again suggested that this may be due to soil or rainfall factors. Forty-five out of forty-eight seedlings established at Nombali and thirty-three out of thirty-five at Seme were A. karroo seedlings. This species is known to be dependent on moisture availability for survival  and these two sites might have better water retaining ability than Le Dube. At week 31, 87 A. karroo seedlings had established as opposed to six of A. nilotica and three of A. luederitzii. The high germination, but poor survival of A. luederitzii suggests that the absence of this species in the Hluhluwe section of HiP is not due to seed limitation or germinability, but possibly due to environmental factors decreasing its ability to establish. The differences in seedling survival between species are consistent with those reported by Kanz  who found higher seedling survival for A. karroo than A. nilotica. The location × grass length interaction revealed the same patterns as for germination with regards to Nombali and Seme with Seme showing better establishment in tall grass and Nombali showing better establishment in short grass. There was no difference between establishment on tall and short grass at Le Dube. The short grass site at Nombali had the highest number of seedlings surviving at week 31. 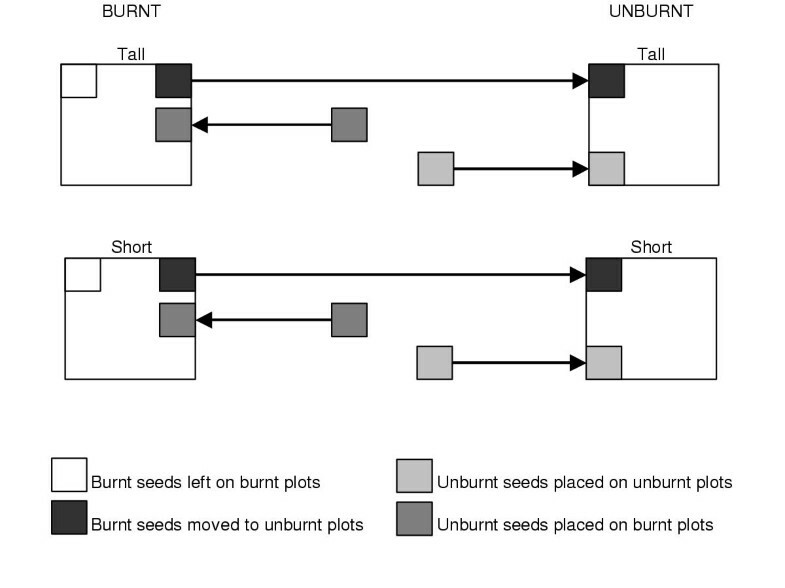 The grass length × site burn interaction displayed the same patterns as for the germination model, but this was not the case for the seed burn status × site burn status interaction. While unburnt seeds still did well on unburnt sites, burnt and unburnt seeds showed decreased establishment on burnt sites suggesting that, as a result of increased irradiance, burnt (open) sites may not hold sufficient moisture for seedlings to survive. The interaction effects found to be significant for establishment only, both suggest the importance of fire temperature. Location × seed burn status and location × site burn status could both relate to the different grass lengths, and thus specific fire temperatures, at the three sites. Temperature sensitivity in Acacia species have been reported elsewhere [11, 14, 17, 20]. Kanz  found increased survival and growth in burnt areas. In this study, Nombali was the only location to have higher establishment on burnt sites, while Seme had increased establishment on unburnt sites and Le Dube very little establishment overall. In general, however, this study found no difference in establishment in burnt and unburnt areas. Chirara, Frost & Gwarazimba  found that intensity of grass defoliation does not affect seedling establishment of A. karroo during the first year. Similarly, there was no difference in establishment of A. karroo in burnt or unburnt and tall or short grass sites. Smith & Goodman  reported that A. nilotica seedlings, however, almost exclusively occurred away from canopy cover, suggesting an inability to establish in shaded environments. Acacia tortilis also showed a greater proportion of established seedlings in open than shaded areas . We did not find a difference in establishment of A. nilotica in tall and short grass, but its establishment was so low that no real prediction can be made. Seedling establishment of A. karroo is strongly moisture dependent  and one would expect that A. karroo is more likely to invade moist rather than semi-arid grassland. This suggests that Hluhluwe Game Reserve, being an area with moist grassland, would be more prone to invasion by A. karroo. It has also been reported that A. karroo has the ability to withstand fire . A combination of these factors may contribute to the success of A. karroo in the field and may be the reason for A. karroo's success over A. nilotica as the most important encroaching Acacia species in HiP at present. The literature does, however, suggest that high intensity fires may result in seed mortality [18, 20]. It has, however, been reported that A. karroo seedlings survive fires from as little as 12 months of age . Therefore, if fires are not hot enough to kill the seeds allowing them to germinate and seedlings to establish, management burns in the following year may not be useful in its attempt to control the establishment of this species. Back fires have higher fire intensities than head fires . We therefore suggest that backfires be used during management burns and that fire frequency be increased in suitable areas in an attempt to slow down the rate of encroachment by A. karroo. It has been reported that spring burns are the most effective ( in ) and this should be taken into account. The study was done in HiP, KwaZulu-Natal, South Africa (28°00' – 28°26' S, 31°43' – 32°09'E). HiP is a 960 km2 fenced protected area comprising the former Hluhluwe and iMfolozi Game Reserves, and the corridor of land that links the areas. The park has a moderate coastal climate, ranges in altitude from 60 – 750 m above sea level  and has a summer rainfall ranging between 760 and 1250 mm per annum. Hluhluwe Game Reserve has a mean annual rainfall of 990 mm, while iMfolozi Game Reserve has a mean annual rainfall of 720 mm . Periodic fluctuations in above or below average annual rainfall occur, resulting in wet and dry spells of approximately nine years . The range in average monthly temperature is between 13 and 33°C . Most of Hluhluwe Game Reserve is found on rocks of the Ecca and Beaufort series with some basalt in the east . King  identified seven geological formations: (1) the Granite-Gneiss base, (2) the Table Mountain sandstone, (3) the Dwyka tillite, (4) The Ecca and Beaufort series, (5) the Stormberg series, (6) fault breccias and (7) recent deposits. The main soils types associated with the Ecca and Beaufort series are Swartland and Sterkspruit, while areas of Shortlands, Milkwood and Bonheim series are found in association with the dolerite regions . They also report that shallow Mispah soils occur extensively in the reserve. The vegetation in the park has been described as bushveld – savannah comprising five broad vegetation types . The thickets are wooded groups of similar-sized, small (usually less than three metres) trees of mainly one species that grows densely to the exclusion of other species. The thornveld consists of scattered thorn trees on grassland with deciduous, broad-leaved trees standing out above the thorn trees while the woodlands are densely wooded areas of tall trees that may contain many different, mainly broadleaved species. The well drained, shallow soils of the rocky outcrops support scattered trees of various sizes, while the termite mounds are nutrient rich patches sustaining dense clumps of trees that form small, wooded islands . Locally the reserve is described as Natal Lowveld Bushveld and falls within the savanna biome . The field experiment took place in the Hluhluwe and Corridor sections of the HiP. Acacia luederitzii occurs in large numbers in certain areas of the iMfolozi part of the reserve but is mostly absent from the Hluhluwe and Corridor sections. Acacia nilotica, A. karroo and D. cinerea are found throughout the park. As opposed to the scattered trees found in iMfolozi, A. nilotica covers extensive areas of Hluhluwe and the Corridor and is usually found below the 300 m contour . Whateley & Porter  described an A. karroo – D. cinerea induced thicket throughout the area, but particularly in the Corridor and Hluhluwe Reserves. Acacia luederitzii seeds used in this study were therefore collected in iMfolozi Game Reserve while those of the other species were collected in Hluhluwe. The effect of fire, fire intensity and burning of sites on the germination of seeds of A. nilotica, A. karroo, A. leuderitzii and D. cinerea was tested in a field experiment. Seeds of all species were collected between May and August 2000. Parasitized seeds were extracted. Prior to planned management burns, six groups of seeds were placed in tall grass (taller than 0.10 m) and six in short grass (shorter than 0.10 m) at three locations (Nombali, Seme and Le Dube). Tall grass produces hotter fires than short grass due to increased fuel load, which increases available heat energy . Sites were cleared of existing pods/ seeds prior to the experiment and as podding season was over, no uncontrolled additions are expected to have occurred. Dichrostachys cinerea seeds were only put out at Seme and Nombali. Each group contained 22 A. nilotica, 25 A. karroo, 10 A. leuderitzii and 10 D. cinerea seeds. Seeds were placed on the soil surface a day before each of the burns (Nombali two days before). This is considered the natural situation for the seeds with soil stored seed banks being virtually non-existent . Seme and Le Dube were burnt on 2 October and Nombali on 30 September 2000 shortly before the start of spring rains and natural seed release. After the burns, three of the groups of burnt seeds were removed from the tall and short grass and placed on unburnt tall and short grass sites at the same location respectively. Three groups of unburnt seeds were then added to each of the tall and short grass sites. A 13 mm mesh cage with 18 cm × 18 cm × 18 cm sides was used to protect each group of seeds and any germinated seedlings from rodent and herbivore predation. Cages were placed at half metre intervals and seeds placed on the soil surface in a group in the middle of each cage Seeds were considered to be germinating when a root started showing. A diagrammatical representation of the experiment is given in Figure 1. Germination was recorded at 1, 3, 5, 7, 9, 11, 14, 17, 20, 23, 27 and 31 weeks. The experiment ended in May 2001. Diagrammatical representation of the experimental design used to test the effect of fire on seed germination and establishment. Arrows indicate movement of seeds between burnt/unburnt tall/short grass plots. We thus applied 96 possible seed treatment combinations for investigating factors affecting germination in the field (4 species × 2 burn treatments × 3 locations × 2 location burn treatments × 2 fire intensities). To test the effect of fire, fire intensity, burning of sites and grass length (shade) on seedling establishment of A. nilotica, A. karroo, A. leuderitzii and D. cinerea, data as on week 31 of the field experiment described above were used. Seedlings were considered to be established when they were rooted in the ground and the cotyledons replaced with leaves. Establishment was based on the total number of seeds. = the interaction effect between the m th grass length and the n th site burn status. , , , , , , , , , and are parameters to be estimated from the data and B, C, D, E and F refer to the explanatory variables species, location, burn status, grass length and site burnt status respectively. The estimated parameters for the GLZ were used to obtain the estimated parameters for the logit model. The estimated parameters of the odds were calculated for each factor or combination of factors (including the intercept) as the exponent of the estimated parameters of the logit model. The estimated odds of germination under any condition were then calculated as the product of the estimated parameter of the odds of the intercept (estimated geometric mean odds) and the factor or combination of factors in question. The odds of germination for significant treatment combinations were compared. The predicted number of seeds germinating and seedlings establishing as calculated with the model based on presence/absence data, were seen as being appropriate for interpretation as summaries of the data. Thus, differences in the predicted mean number of seeds germinating and seedlings establishing (given as a fraction of the total number of seeds) were illustrated graphically for each significant treatment combination. The University of Stellenbosch (Hofmeyer Fund) and the University of Cape Town (Andrew Mellon Foundation) provided financial support for this study. The KwaZulu-Natal Nature Conservation Service is thanked for permission to work in the park. We wish to thank the staff of the Hluhluwe Research Centre for their input and support in managing the logistics of the project and for assistance in the field. Thanks go to Charlie Boucher, Sue Milton, Tim O'Connor and Nico Smit for their comments on earlier drafts of this document. MW designed the experiment, participated in fieldwork, performed the statistical analysis and drafted the document. MJS participated in fieldwork, the coordination of the study and drafting of the document. JJM supervised the work and assisted in the drafting of the document. All authors read and approved the final manuscript.